Those of us who plan to be present at the most important events in this grand festival of visual arts have to constantly travel all over the city. To enjoy the inauguration of one of the principal shows, many of us took the ferry across the bay where the town of Casablanca awaits us. It is the site of many different practices that started there, especially those based on making the most of the originality of its surroundings, its symbolism, its community projects and the only electric railway in Cuba. This too is where the prestigious French artist Daniel Buren has his exhibition. As never before, I feel that this year there has been a positive connection between the official program and the collateral shows, both in terms of the artists’ themes and the languages and concepts utilized. Therefore these connections ended up being favorable ones, offering the public some concrete clues about where Cuban and world art is heading. Within the official program, I was especially interested in the exhibition organized at the Wifredo Lam Center for Contemporary Art. Performance and art-as-object concepts were alternated successfully. The show called Montañas con una esquina rota, curated by Wilfredo Prieto, chose an old bicycle factory as its venue. Here a significant group of international artists such as Richard Wentworth, Abraham Cruzvillegas, Román Signer, Helen Mirra, Navid Nuur and Roman Ondák were brought together along with Cuban artist Eduardo Ponjuán (recipient of the 2013 National Visual Arts Prize). Theatre-associated performances had the effect of enriching this exhibition environment. Once again Pabellón Cuba is exhibiting one of the official shows: the group project called “Entre, Dentro, Fuera/Between, Inside, Outside” with the participation of artists such as Agnes Chavez, Pedro Lasch, Casey Neithtah, Stephanie Syjuco, Elizabeth Stevenson, Levente Sulyok, Susana Delahante Matienzo, Omar Estrada, Adonis Ferro, Denis Peralta and Maysabel Pintado, Glenda Salazar and Levi Orta. Performances also played a large part at this venue. Many painters have opened the doors to their studios for group shows. In some instances some daring curatorial efforts have been the result. “Open Studio” is the name of this artistic event that has allowed the public to approach different studios across the city belonging to artists Reynier Leyva Novo, Carlos Bustamante, Sandra Pérez, Iván Capote, Ernesto Rancaño and El Montalván Estudio. TheMontalván Studio is exhibiting works by some of the most important Cuban printmakers today: Rafael Zarza, Octavio Irving, Osmeivy García, Marcel Molina and Liudmila López. 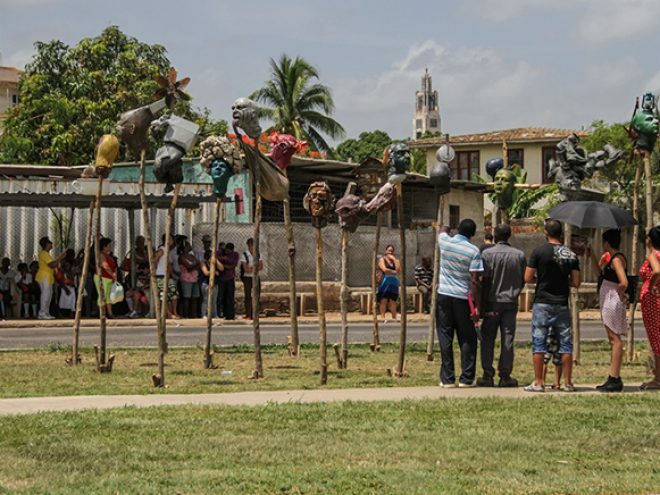 A group of Brazilian artists have been cooking on a corner of a Centro Habana neighborhood both for its inhabitants and for those who visited the show. The work became an exercise in cooking Brazilian and Cuban food, thereby setting up a strong communicative bond. Also in the working-class district of Centro Habana, specifically in the Colón neighborhood, architecture has been present in a very significant manner by way of twelve different projects that aim at initiating improvements for the inhabitants. Ancient parts of Havana, neighborhoods where popular memory has been very visible, have been re-dimensioned through video mapping and therefore have been subjected to new interpretations through this new way of decoding old surroundings. Both inhabitants and visitors have had the opportunity to see those places from different angles, leaving us with the healthy feeling that everything can have a wide variety of nuances. Scattered throughout the city, many performances are being put on, some of which tie into music and dance. Uruguayan artist Tamara Cubas’ “Multitud” is being put on the small stage at the University of the Arts, and “Thirteen Less Two” by Michelangelo Pistoletto, at the Iglesia de Paula Church) with the collaboration of the Ars Longa Early Music Ensemble and Teresa Paz, its director, based on a Luis Alberto Mariño composition. There is no doubt that the Biennial has decided to make an intervention on the city in an intensive way and to salvage the stellar moments and details of its past. Along these lines is the splendid Kadir López project called “Havana Lights.” It is an attempt at reanimating and also dialoguing ironically about things lost that can still be rescued. In this instance, Kadir’s target is the restoration of eleven neon advertising signs that have been placed in front of several movie theaters, which were their original locations. Having fallen into disuse, their visual connection was broken, so under this conception, the neon signs have been conceived as artworks in themselves. Touring around Havana these days gives you a true sense of how this year’s Biennial has given us new rhythms and new aspirations for a city that seeks to transform itself. June 2015 This article formed part of the june 2015 issue of What’s On Havana The definitive monthly travel & culture guide to Havana Download our current issue of What’s On Havana, your definitive travel, culture and entertainment guide for all things happening in Havana, Cuba’s bustling and enigmatic capital city. We include features from around Cuba written by the best international travel writers covering Cuba. Our monthly online digital magazine is also available in Spanish and French.